Recently we welcomed the author Andrew Cook to the BPMA to speak about The Great Train Robbery, one of the most infamous crimes in British history. On 8th August 1963, £2.6 million (equivalent to over £45 million today) was stolen from a Royal Mail Travelling Post Office. The bulk of the money has never been recovered, and there has not been a single year since 1963 when one aspect of the crime or its participants has not been featured in the media. But despite the wealth and extent of this coverage, a host of questions have remained unanswered: Who was behind the robbery? Was it an inside job? And who got away with the crime of the century? Fifty years of selective falsehood and fantasy has obscured the reality of the story behind the robbery. The fact that a considerable number of the original investigation and prosecution files on those involved and alleged to have been involved were closed, in many cases until 2045, has only served to muddy the waters still further. When researching his book, The Great Train Robbery – the untold story of the closed investigation files, Andrew Cook spent a lot of time at the Royal Mail Archive, which holds extensive material about the robbery. In his talk at the BPMA Andrew explained how he did the research and what he found. A recording of this talk is now available as a podcast, which is free to listen to or download from our website, iTunes and SoundCloud. Our exhibition The Great Train Robbery, the aftermath and the Investigations: A Story from the Archive is currently on a national tour, or viewable online at the Google Cultural Institute. 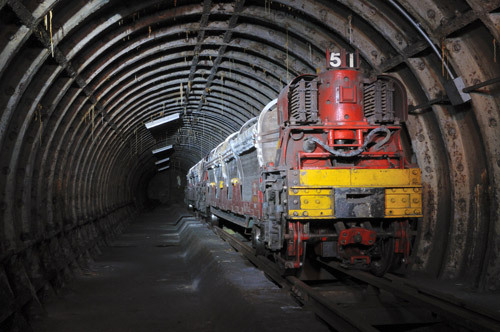 On Saturday 14th September the Royal Mail Archive will be holding a themed open day to celebrate the Post Office Underground Railway (Mail Rail). Activities will run from 10.00am until 4.00pm, however the Archive search room will be open to visitors until 5.00pm as usual. 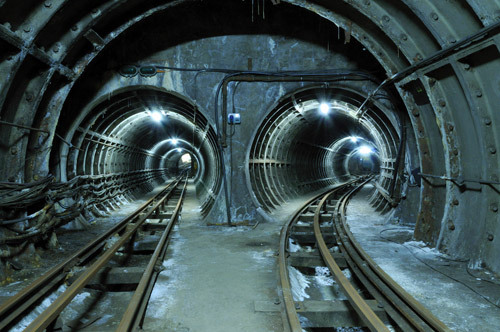 The Post Office Underground Railway initially opened in 1927 and was the world’s first driverless electric railway. It ran from Paddington to Whitechapel, serving eight sorting offices along its six-and-a-half mile route. Jonathon Bradley, the photographer responsible for the Mail Rail Photographic Exhibition (currently on display in the search room), will be on hand to talk about his photographs and give informal workshops. Jonathon will also bring along his interactive Mail Rail game Mail Rush, and members of the public will be encouraged to take part. 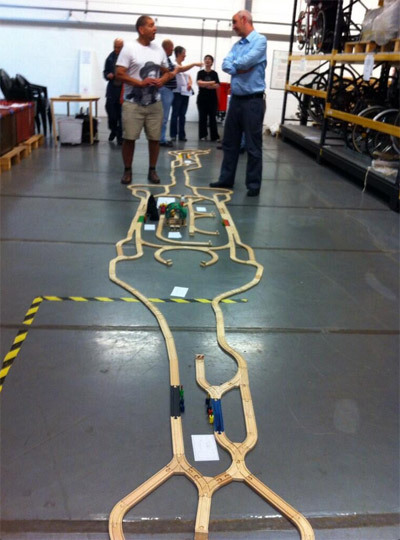 The Mail Rush game at our recent Museum Store Open Day. We will also have Mail Rail-themed craft activities available for children to take part in, while for older visitors there will also be original archive material on Mail Rail, including photographs, diagrams and leaflets, all dating between the 1910s to the 1970s, available to view. Archive and Curatorial staff will be on hand to discuss this material with members of the public. Throughout the day there will be tours of the Archive repository, covering a selection of Royal Mail’s history. There is no need to book for these tours as they will be arranged on a demand basis. This is a free, drop in event and there is no need to register, but please note that the Search Room will also be open for general research on this day. If you wish to carry out research you will need to sign up for a User Card (please see our website for information on signing-up for a User Card). Hope to see you all there and if you can’t make it we should be live tweeting throughout the day! 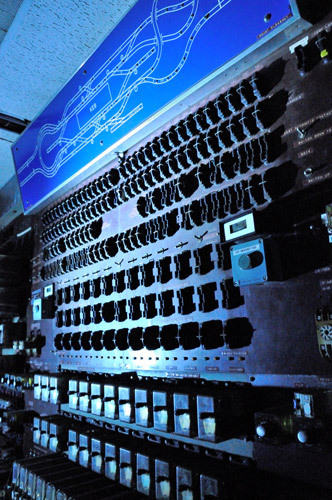 Find out more about our Mail Rail Archive Open Day on our website. 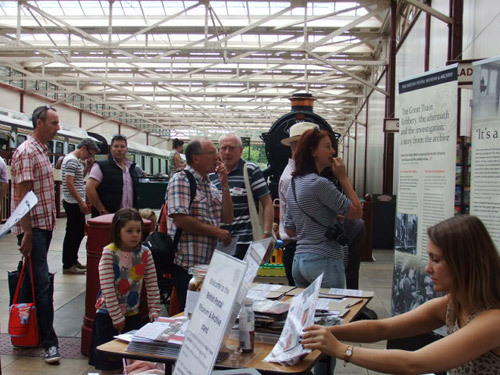 On the weekend of 10-11 August, the BPMA took part in the Moving the Mail weekend at the Buckinghamshire Railway Centre. We also mounted our new touring exhibition The Great Train Robbery, the aftermath and the investigations: A Story from the Archive. 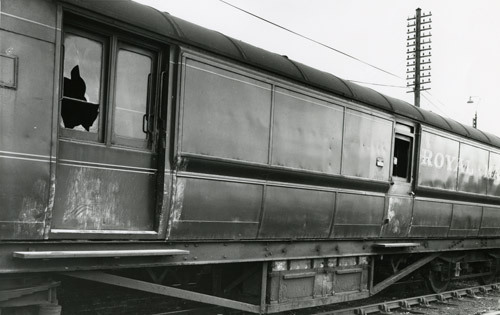 The exhibition was particularly appropriate as it was nearly 50 years to the day since the robbery had occurred – on 8 August 1963; the robbery had also taken place very close to the site of Buckinghamshire Railway Centre. Many visitors engaged with the exhibition, looking through facsimiles of files held at the BPMA relating to the investigation carried out by the Post Office Investigation Branch in the wake of the robbery. Files included observation reports, mugshot images of suspects, and images of the interior of the suspects’ hideaway Leatherslade Farm. The public looking at the exhibition. We met many visitors who had direct memories of the night of the robbery- from the Travelling Post Office (TPO) workers who had waited in vain for the hijacked train, to policemen stationed at Aylesbury – and to the locals who lived through the search and investigation in the days that followed. 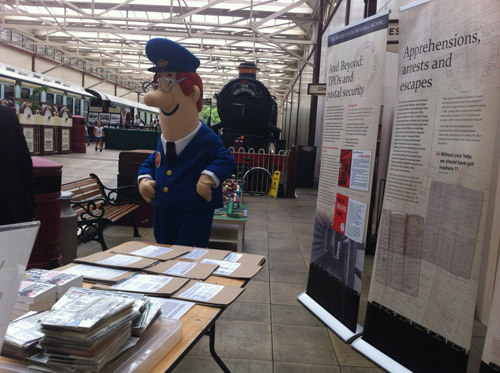 There were lots of other events happening over the weekend too: Postman Pat visited and was clearly impressed with our exhibition! There were also rides on steam trains and the opportunity to see inside a TPO carriage. Our Senior Curator, Julian Stray, was amongst those giving talks; there is a chance to hear his horse-drawn mails talk again on Thursday 19 September, 7pm, at the Phoenix Centre. Postman Pat visits the exhibition. Our thanks go to Buckinghamshire Railway Centre, particularly Cyril Parsons and Sheila Lobley. The Great Train Robbery exhibition is now on tour and can shortly be seen at various venues across the country. It is also available for free hire. Please contact Dominique Gardner, Exhibitions Officer, for more information, on 0207 354 7287 or at dominique.gardner@postalheritage.org.uk. 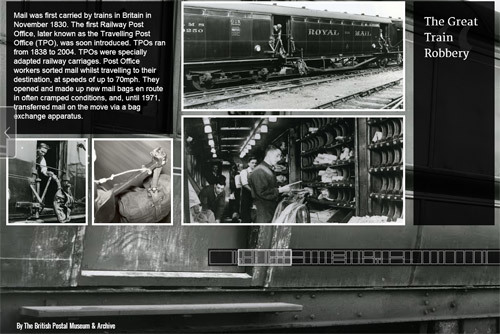 An online version of our Great Train Robbery exhibition can be seen on the Google Cultural Institute website. On Saturday 24th August we will be holding an open day at our Museum Store in Debden, just 20 minutes from the hub of Stratford, London. Behind its unassuming façade, the Museum Store houses a wonderful collection of the BPMA’s larger exhibits, each with a story to tell. As part of the Hidden Treasures 2013 event come and find out about a hidden strand of postal history – the Post Office Underground Railway. 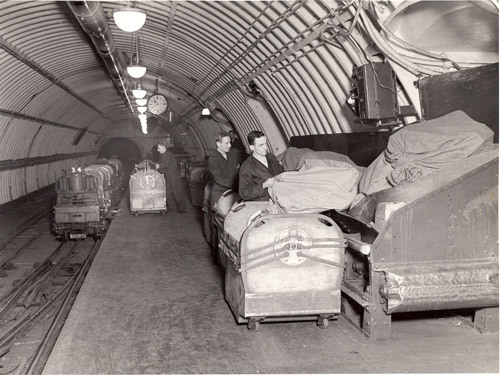 The Post Office Underground (London) Railway, or Mail Rail as it was later called, opened on 5 December 1927 and ran under the streets of London transporting mail across the capital from sorting offices to railway stations, 22 hours a day, 7 days a week. One of many unique features of the system is that it was driverless and as such was hailed by the press as a ‘Robot Railway’. The railway played a pivotal role in the transportation of mail in London and continued, rarely interrupted, until 2003. This was due in no small part to the great skill and knowledge of the engineering and maintenance teams. 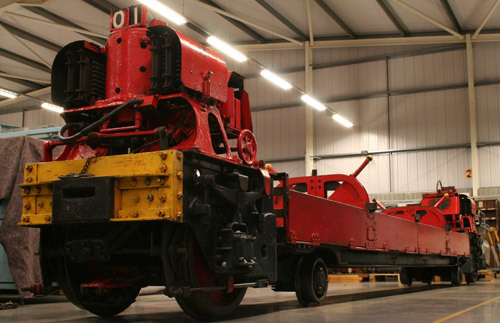 The BPMA holds three rail cars in its collection, one being the only known complete example of the original car used in 1927. 1930s Mail Rail train after conservation. Visitors will have a chance to see these and other objects relating to the railway and hear about the history of the Post Office Underground (London) Railway through our short Curator-led tours. Throughout the day you can also explore the rest of our stored collection, as well as take part in activities, enjoy some refreshments in the form of tea and biscuits, and watch film footage all connected to the fascinating Post Office underground railway (except perhaps the biscuits…). There will also be a chance to see the BPMA’s most recent touring exhibition on The Great Train Robbery, which took place on a Travelling Post Office 50 years ago this August. The exhibition looks at the events of the robbery itself, as well as the vital role played by the Post Office Investigation Branch in the subsequent investigations, as reflected in our Archive. There’s plenty for all the family and the event is free for all, so please do drop in throughout the day between 10am and 4pm. Full details of the event are available on our website. 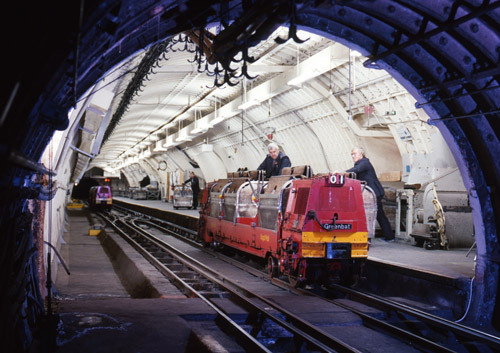 Mail Rail: A Photographic Exhibition is currently showing at Royal Mail Archive, Clerkenwell, London. Entry is free. Jonathan Bradley previews his exhibition Mail Rail: A Photographic Exhibition, which opens at the Royal Mail Archive today. For three quarters of a century, one of the most successful underground railways in the world transported mail under the busy streets of London until its service was suspended in 2003. It remained largely unknown to the general populous aboveground. Waiting in the dark – 1930s car in the siding. Image ©Bradley Photography, Northumberland. 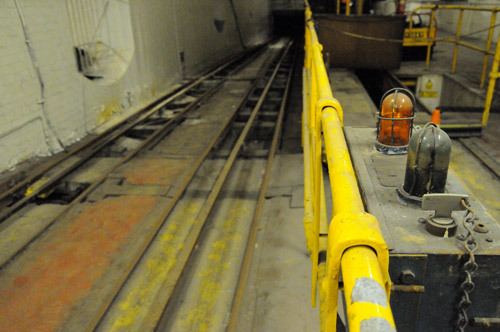 The Post Office Railway (AKA Mail Rail) is a unique and remarkable infrastructure, being the only dedicated driverless mail haul railway in the world. It came to my attention some two years ago while surveying for another framework environment for the ongoing People : Space work. People : Space is a human spatial study and finding appropriate environments to deliver an artistic treatment to is not an easy task. 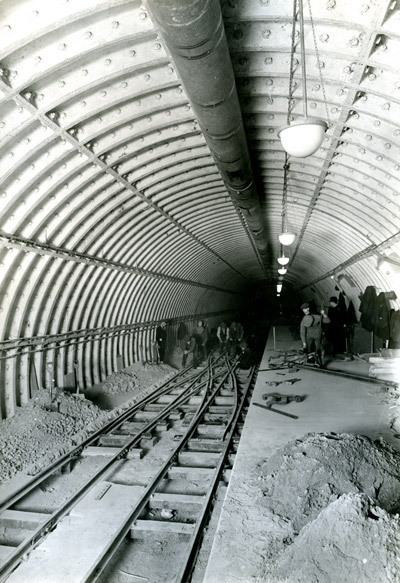 However, the Mail Rail had the necessary attributes and photography began in 2011. Descent to the Mount – Twin tunnel. Image ©Bradley Photography, Northumberland. People : Space encourages viewers to look at spaces and areas that are or can be occupied by humans and visa-versa. Photographically capturing space is very challenging and this project often projects vistas that indirectly depict this. Frequently, the humanity element can be suggested. Within each of these pictures lies a distinct, tangible thread of humanity and though the photographs present and record a view of the railway in a quiescent state, the subtle compositional detail of the images lean the eye to regard these degrees of freedom – spaces that contained workers, movement and sound. Relay board – ‘Blue’ relay board photograph. Image ©Bradley Photography, Northumberland. Consider the sound of footsteps, the noise of trains, mail being unloaded off conveyors and cherrys being clicked. Think of the people who walked the platforms, who loaded mailbags, the engineers and fitters tirelessly working in the car shed above Mount Pleasant Station, the section controllers shuffling levers and moving trains and the line crews who worked during maintenance hours who serviced the railway that is now dormant and silent. Contrast what was before with what you see today and consider these People and their Spaces. Unable to Accept – Green and Yellow lights with acceptor panel. Image ©Bradley Photography, Northumberland. 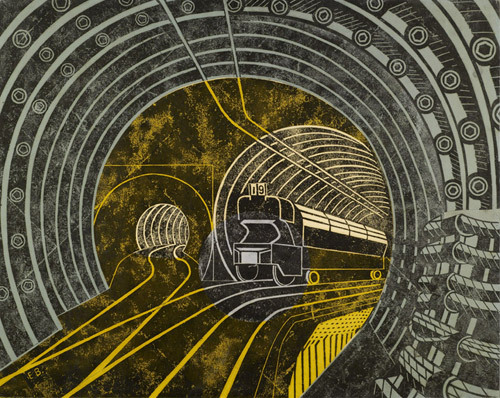 Mail Rail: A Photographic Exhibition is on display in The Royal Mail Archive, London. Entry is free. A selection of exclusive prints signed by Jonathan Bradley are available from the BPMA online shop. Mail was first carried by trains in Britain in November 1830. The first Railway Post Office, later known as the Travelling Post Office (TPO), was soon introduced. TPOs ran from 1838 to 2004. 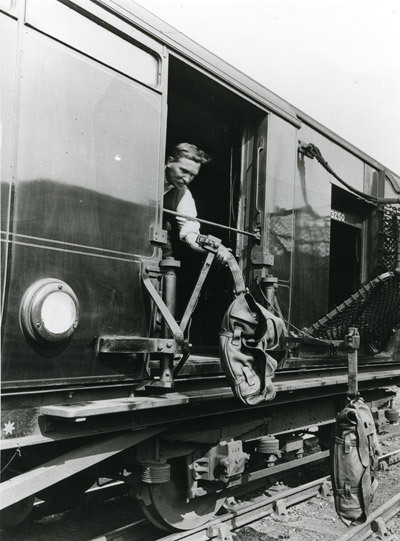 TPOs were specially adapted railway carriages. Post Office workers sorted mail whilst travelling to their destination, at speeds of up to 70mph. 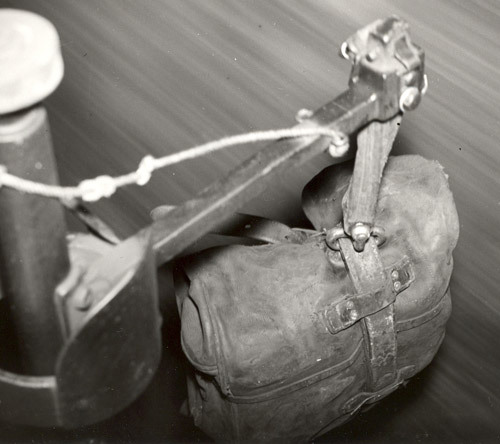 Workers sorted the mail, in often cramped conditions, and, until 1971, transferred mail on the move via a bag exchange apparatus. The trains often carried large quantities of high value material. This combined with a relative lack of security on board made them a target in 1963 for the heist that became known as the Great Train Robbery. In the early hours of Thursday 8th August, 1963, the Up Special TPO was travelling from Glasgow Central Station to London Euston. At 3am, it was held up by a gang of criminals in an orchestrated attack and around £2.6 million was stolen. The audacity of the attack and the brutality used stunned the GPO and the general public. The TPO carriage following the robbery. © Thames Valley Police. The TPO coach was carrying 128 sacks of High Value Packets, all with noticeable- and easily identifiable- red HVP labels attached. A staggering 120 sacks containing 636 High Value Packets were stolen in the Robbery. The money enclosed in the missing packets totalled £2,595,997.10s.0d. The £2.6 million stolen is equivalent to over £45 million today. The banks offered an unprecedented reward of £250,000 for information about the robbery. £10,000 was added to the reward by the Postmaster General who rushed back from holiday after hearing about the crime. The movements of the 77 PO employees on board the TPO on the night of the robbery were scrutinised. Many were interviewed at length, as were other staff that happened to live in or near the vicinity of the home of a robber. Within The Royal Mail Archive held at The BPMA there are witness statements of the TPO staff (POST 120/106-8) and files devoted to those Post Office employees suspected of potential ‘leakage of information’ (POST 120/128-9). Despite intense speculation and the enquiries by the Post Office Investigation Branch (later Investigation Department) no proof has ever been found of a Post Office insider. Twelve suspects were tried and convicted within nine months of the Robbery thanks to the combined efforts of Buckinghamshire Constabulary, the Transport Commission Police, the Post Office Investigation Branch and New Scotland Yard. Many of those convicted were given maximum sentences of 30 years for armed robbery to reflect the seriousness of the crime. 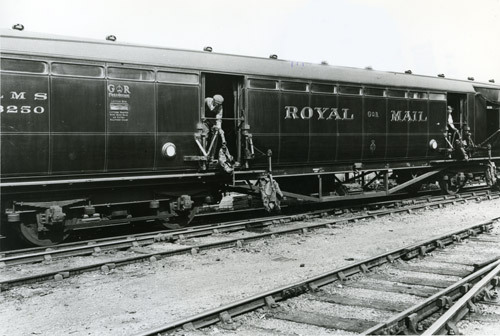 The investigations that took place in the wake of the Great Train Robbery of 1963 were part of this long history of detecting crime in the postal service. 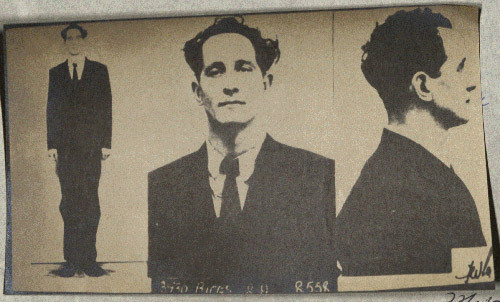 Those playing a vital role in Royal Mail Group Security today are successors to those who helped apprehend the most notorious train robbers in history. 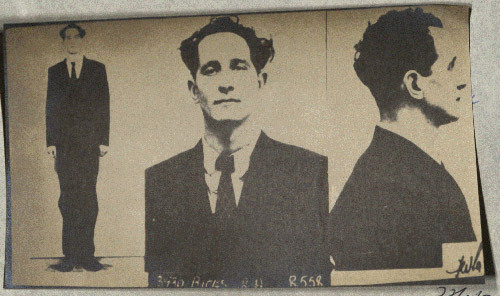 The investigations of the Post Office Investigation Branch into the Great Train Robbery are documented in a report prepared by Assistant Controller Richard Yates in May 1964. This report can be found in The Royal Mail Archive at The BPMA (POST 120/95). The BPMA also holds many other files concerning the Robbery including several detailing bank losses and property eventually recovered (POST 120/112-9) and observation reports (POST 120/130-3). 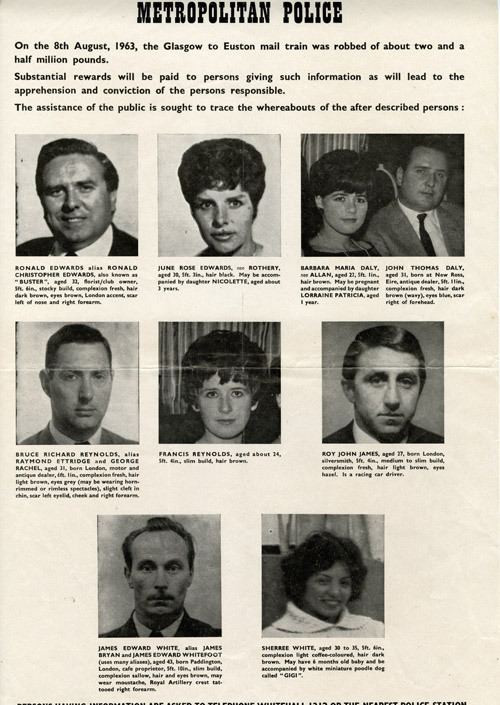 The exhibition will be on display in the BPMA Search Room on the 8th August to mark 50 years since the Robbery took place, from 10am to 7pm, followed by a talk by author Andrew Cook. The exhibition then goes on tour around the country. Full listings of the venues hosting the exhibition can be found on our website. Please contact The BPMA Exhibitions Officer on 0207 354 7287 or dominique.gardner@postalheritage.org.uk for more information or if you would like to hire the exhibition.